So we have all this excitement about having a baby and then we are reminded that we have a ways to go and I’m very much pregnant. Do you know what pregnancy entails? Some of you do and some of you are running for the hills because hearing anymore might be TMI (too much information, for the acronym challenged)! Miserable. We’ll just leave it at that and move forward with the hopes that I start to gain weight like a sumo wrestler soon and have enough energy to leave the apartment. What I really, really want is to eat food again and like it. I don’t think that’s asking too much. 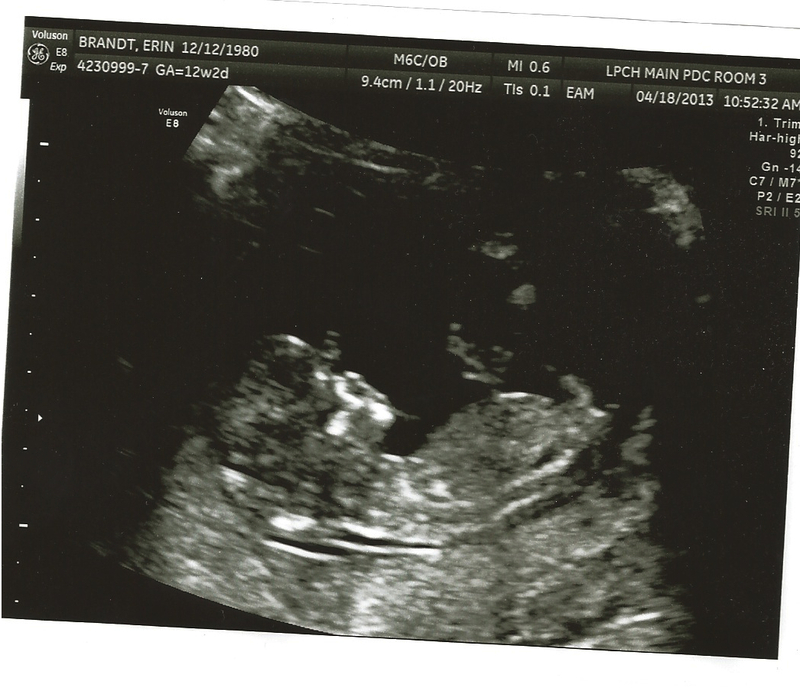 We had a doctor’s visit a couple of weeks ago that was meant to measure the neck of Fetus Brandt. This was the second test we did relating to genetic disorders. We were at a completely different hospital with a whole new set of doctors/nurses. I think of it like going to a huge university and being a number and not a name in a classrrom with 500 other students. It’s cray cray (Matt’s new favorite saying). 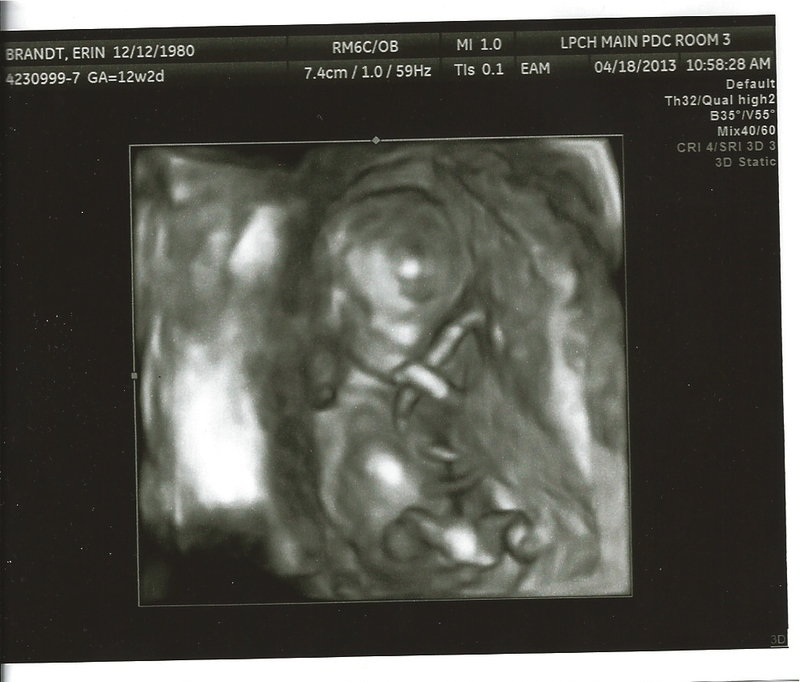 Anyway, we have more sonogram pictures and even some futuristic looking 3D & 4D images. Ooooooh! I’ll post them below. We were able to get results from the neck measurement and the blood test I had done the week before and the likelihood that Baby Brandt would be born with Down Syndrome is 1 in 3000, a negative result since the cutoff is 1 in 100. And for Trisomy 18 the result is 1 in 57,000, another negative result with a cutoff of 1 in 50. I’ll be going in for a final blood test on May 13th that will provide us with more information on Down Syndrome, Trisomy 18, and a few other genetic disorders. No matter the results Baby Brandt will be welcomed with open arms and smothered in love! I get updates from all over the Internet but my favorite is from the blog the Pregnant Chicken – the author is my kind of sarcastic! And instead of a lemon, the baby is the size of cupcake this week! Yay cupcakes! I don’t really want to eat one but maybe y’all could eat one or five for me. Some of the cool things that Baby Brandt has been up to include growing fingerprints, making faces, sucking their thumb, and peeing! Folks have been asking if I have a baby bump, yet, and I do but it is dwarfed by my bloated belly. So although I look pregnant it’s not so much the kid as it is gas. Don’t worry I’ll have some adorable baby bump pictures up once I’m showing the real deal. And finally, here are the cutey pictures of Baby Brandt swimming or rock climbing (according to Matt) in the amniotic fluid. Enjoy!